Warning and disclaimer statement: Opening or modifying a device such as this will void its warranty and can create failure modes that lead to property damage, injury or death. We disclaim any warranties regarding the accuracy or reliability of this information, and will not accept liability for any injuries or damages that may result from the reader's use of this content. The placement of one resistor at time of manufacture puts this Samsung SDC-7340BCN into normal video mode, instead of a mirror mode such as that output by a backup camera. As opposed to conventional cameras, backup cameras output a mirror image so that what you see in the image is on the same side as it is on the vehicle. 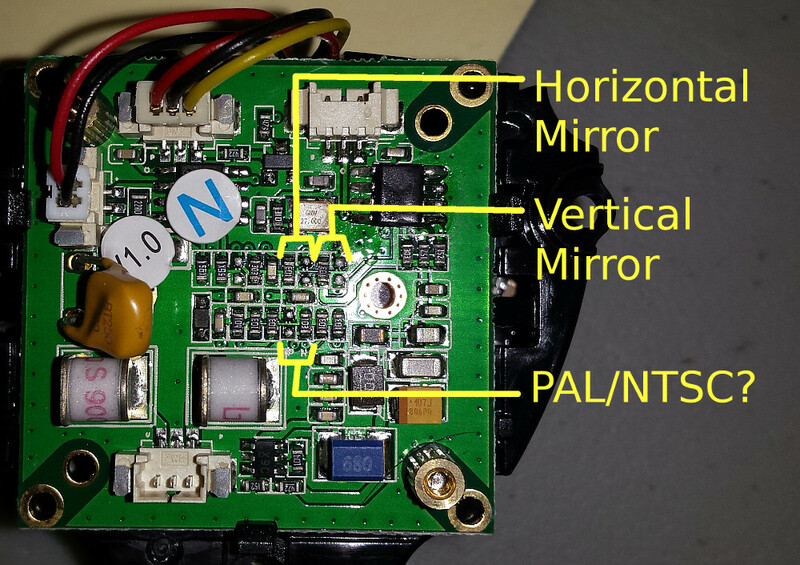 Many vehicle monitors accept composite video, which this camera outputs. This night vision camera, found on deep discount at RadioShack, produces a clear image in low light. Based on the resolution and packaging of the image sensor, it seems this particular camera uses a PixelPlus PC1099K image sensor. For a composite video camera, this sensor has a lot of pixels and produces a comparatively sharp image. Searching for "PC1099K" returns hits for many different cameras, which likely are similarly configured. The PC1099K is apparently designed to be used not only as a normal camera but also as a backup camera, and has features that allow the placement of guide lines over the video image. The horizontal and vertical mirror modes are determined by applying a pull-up or pull-down resistor to certain pins on the image sensor. In this camera, the designers placed pads side by side, so that the placement of a resistor on one side would pull down the pin, and placement on the other would pull it up. This lets the manufacturer select the mirror and PAL/NTSC modes at manufacture simply through the placement and omission of resistors. During manufacture, one pad is populated and the other is left open.